Kwab van het witte doek is a hybrid comic. It uses photo’s and illustrations. After 70 years comic artist Stefan de Groot discovers a hidden archive of his grandfather Marinus Hollanders. 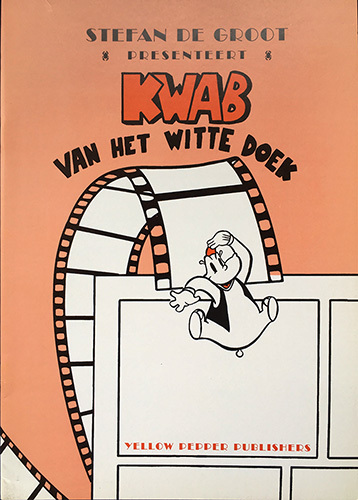 Marinus Hollanders had a cartoon studio called Tekenfilmfabriek Hollandia (Cartoon Factory Hollandia) that produced silent animated cartoons for the cinema featuring Kwab the Hippo. Stefan de Groot tries to recreate Kwab and is drawn into his own comic and meets Kwab the Hippo eye-to-eye.